It’s been seasons since I last posted. The simple fact that I can say that would have made 2013 Me really happy. 2013 Me couldn’t even imagine getting to where I am today. I haven’t written because I haven’t need to. I don’t think about my hips all the time anymore. Most of the time I don’t think about them at all. They no longer rule my life, activities, thoughts and I am no longer in chronic pain. I guess what I’m saying is that, cross my fingers and knock on wood, I’m better! Sure, better is relative. I am so much better than I was a year ago when I was being primed for the possibility of a hip replacement because of the persistent and exhausting pain. I am better than I was after each of my four surgeries. I can sit cross-legged on the floor and I am back to flying trapeze, aerial silks, the gym – everything but running (but I think I’ll get there). No – I’m not better than I was before all of this started. I do still have some pain, mostly aches if I sit too long or push myself too hard but at this point, who cares? I sure as hell don’t. I saw my surgeon Dr. Sink at HSS today for what was basically my 2 year follow-up from my PAO and my almost 2 year follow-up from my SDD. To my surprise I was told that I don’t need to come back for three years, and then only if I want to. We agreed that I’ll probably need a hip replacement (or two) sometime down the line but for now, I’m A-OK. In fact, my x-ray weirdly looks like I never had a single surgery. It took me twice as long as to heal as normal so yea, it was crazy how long it took – like molasses on a 10 degree incline slow – but I am pretty much there. I also know that Dr. Sink and everyone at HSS will be there if my hips falter, my stand-by support system. So as of now, the blog part of this site, as it is, is on indefinite hiatus. I’ve decided that I am going to maintain and improve the site so that people who are searching for information have a resource. I still get between 50-100 hits a day, so clearly there are people out there who are looking for information and I’d like to help them. For most of you it’s “until we meet again.” Thank you all, for the kindness you have shown me. I was not alone through this – you were with me, reading along, and I am genuinely grateful. This entry was posted in Exercise, HSS, PAO, Running, SDD (Surgical Dislocation / Open), Trapeze, Uncategorized and tagged Dr. Sink, hip dysplasia, hospital for special surgery, HSS, PAO, SDD on March 5, 2015 by dramaticallyhip. Holy macaroni has a been a while! 6 months since my last post is inexcusable so I have made a commitment that even if I do not have an impending surgery scheduled, that I will update my blog at least once per season. And this, dear readers, is summer. Since I last posted, I completed the “plan of attack” I mentioned in my previous post — a combination of 2/week pilates, 1/week physical therapy, daily anti-inflammatories, and monthly meetings with my surgeon. I still need to lose weight (for health reasons) but am hopeful that the regimented schedule required by part-time law school in the fall will help that along. I am happy to say that my right hip, the PAO side, is doing really well. In general, I have no pain unless I walk for a really long time and even then, the pain is mild (though I have to acknowledge that I haven’t pushed my hips beyond basic activities like walking). Dr. Sink has been very happy with this recovery as well, although he did acknowledge that my recovery from the PAO was about 200% of the average. I am the turtle of recovery but dammit, I think I pretty crossed the finish line. The left hip continues to strengthen but unfortunately, the pain caused by activity – specifically any significant distance walking – has steadily increased. As a result, my left hip is out of line and thus in pain. Often, after sitting for a period of time, my left hip will ache just from standing up and I limp around for a while like a Weeble-Wobble. I avoid stairs as much as possible because they cause the greatest pain. On top of it all, I have maxed out of PT sessions because apparently I am ‘all better.’ All of that said, Dr. Sink and I agree that it seems possible that it will continue to improve, if slowly, so I am going to wait a bit longer see him around Christmas to discuss next steps and to have new MRI and X-Rays taken. 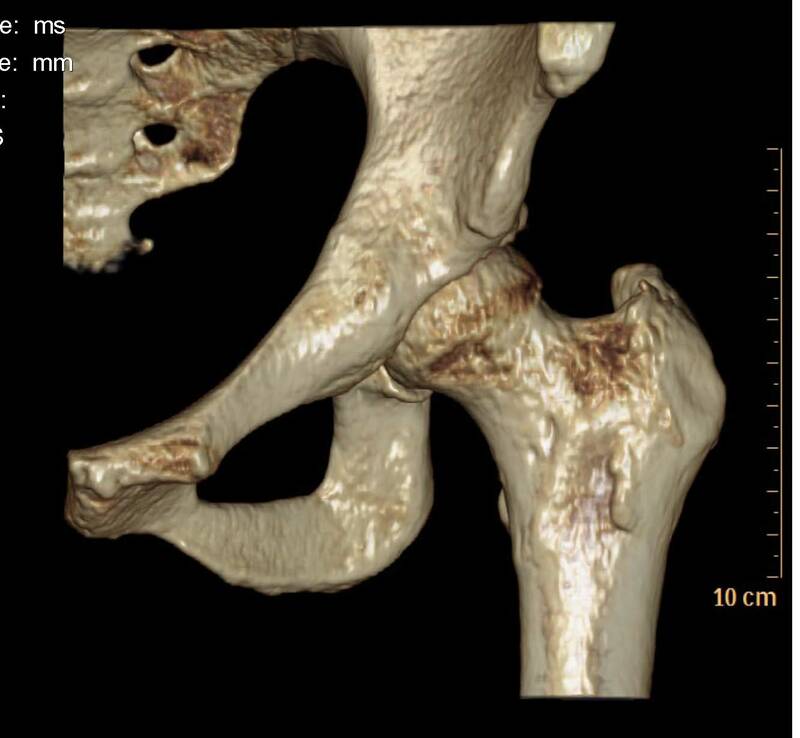 Based on my symptoms and the pain level, my guess is that I will have a total hip replacement within the next 9-15 months. All of that said, I start back at my last semester in of law school in 2 weeks, followed by the Bar in late February, and then I’m DONE! While it is unlikely I will ever run again, I’ve wrapped my head around that fact. However, I continue to take pilates, bowl, golf, ride my bike (on occasion) and even take weekly trapeze classes — strangely, trapeze doesn’t bother my hips a stitch — and here is video proof from my trapeze show on August 8th. Onwards to Fall! This entry was posted in Bike Riding, Exercise, HSS, Knee pain, Recovery, Trapeze, Uncategorized and tagged Dr. Ernest Sink, Dr. Sink, hardware removal, hip, hospital for special surgery, HSS, Knee Pain, Limp, Limping, Open Surgical Dislocation, PAO, recovery, SDD, Trapeze on August 10, 2014 by dramaticallyhip. Just under 3 weeks post screw removal and I did something today that I had honestly believed I’d likely never do again. I ran! I decided to try to go for a walk to see how my hips are really doing by testing them out. I’ll admit that and it was rough at first – the bursitis in both hips (especially in my left) is definitely still there and both psoas were a little crabby – but felt a little better after a while (or maybe I was just numb – it was pretty cold outside). So after I’d been out about 20 minutes and was feeling a little cocky, I figured what the heck and just jogged/ran a block. It didn’t hurt any more or less than walking and felt so incredibly freeing that it was like I was dreaming. I proceeded to walk/run for the next 40 minutes, mostly walking but taking breaks to jog a block or two. I smiled the entire way. I’m gonna ask my physical therapist if there is any reason I really shouldn’t run a bit but I think that as long as I’m careful and take time to strengthen and stretch they’ll be on board. I was never a very good or fast runner but I really loved it. I am so happy to imagine that it could someday be a real part of my life again! Oh, and I had my 2 week post-op last Monday and all went well. Dr. S. was really happy with my progress and pleasantly surprised that I wasn’t using any sort of walking aid, either a cane or crutch. My scars are healing quickly and I’m not due for another follow-up until April. I got my operative report which did note that they’d had to repair my bursa when they removed the screws and that I’d had a lot of bursitis in my left hip, a fact that came as no surprise to me based on my previous levels of discomfort. I am meeting with PT before that so they can give me guidance on what I should focus on. This entry was posted in Exercise, Recovery, Recovery Pains, Running, Screw removal and tagged Bursitis, Dr. Sink, hardware removal, PAO, recovery, Surgical Islocation, trochanteric bursitis on January 19, 2014 by dramaticallyhip. It’s been 4 days since bilateral hardware removal and today I was finally allowed to remove my bandages and take a proper shower. 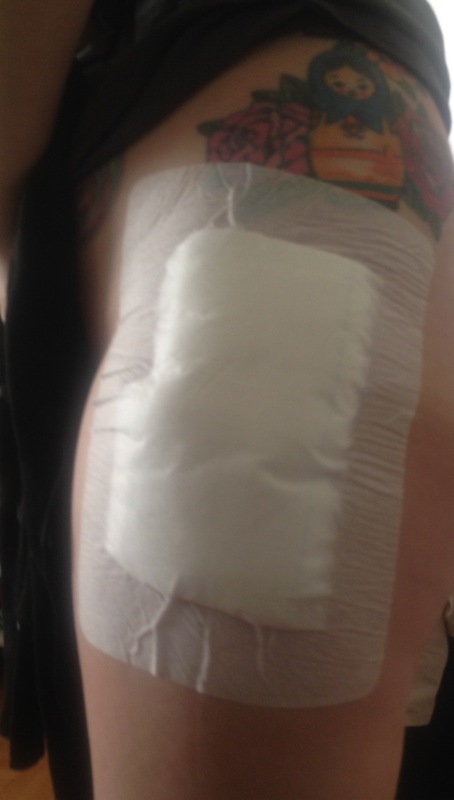 I saw the new incisions on each hip for the first time and truthfully, they’re not as bad as I’d anticipated. At about 4″ long, they’re each approximately half the length of the incisions from the original surgeries. They are healing nicely (although they look a little gory with dried blood and steri-strips) – I decided not to post pictures of them until they look a little bit better (you’re welcome). 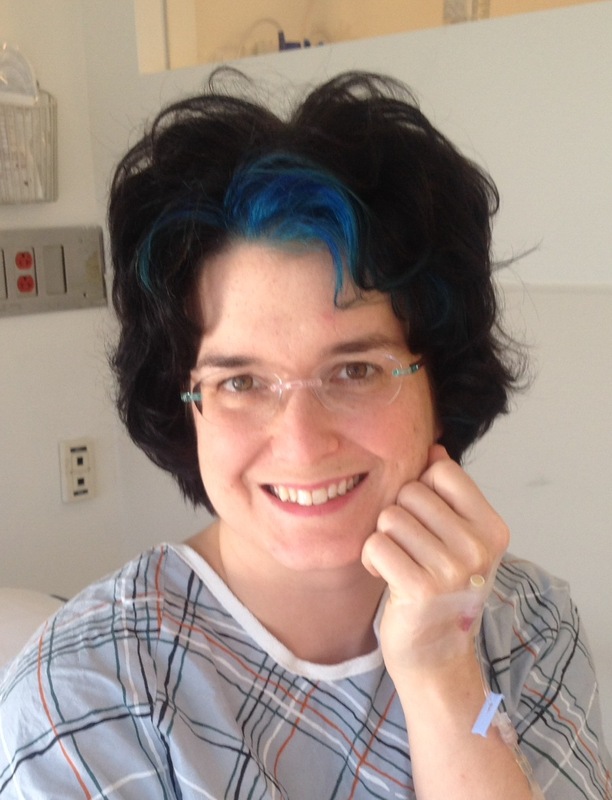 I can’t yet tell if surgery fixed my remaining issues – it’s just too soon to tell. I probably won’t know for certain until the inflammation goes down which might take a while. That said, I am cautiously optimistic. Earlier today I made the exact same mistake I’ve made after pretty much every surgery – I acted like I had not just had surgery and tried to do a couple things around the house. I paid for it with a serious bout of nausea and exhaustion. I know this was a “minor” surgery but it still involved somebody cutting into me and my body feels the need to remind me of that fact. In general I’m worn out most of the time and get so sleepy that I can doze off at the drop of a hat. I’m sure it’ll take me several weeks or even a month or two to really get back to feeling normal. I’ve started to pull back on my pain meds since the pain has lightened a bit. I haven’t had leg cramps in the last day (a huge relief) and the itchiness has gone now that I’m off the Percs (a definite downside to opiate medication). That said, I wouldn’t be surprised if I have to kick them up for a period of time since recovery is all ups and downs. I’m hoping to try some PT exercises at home once I feel up to it, starting with mild things like bridges, clamshells, squats and the like. My next appointment with my surgeon is January 13 when he will clip the ends of the dissolvable sutures and will likely discuss formal PT and steps moving forward. For now, I’m falling asleep. Goodnight and sweet dreams. This entry was posted in Exercise, Leg Cramps, PAO, Recovery, Recovery Pains, Scar, Screw removal, SDD (Surgical Dislocation / Open), Stabbing pain and tagged dysplasia, exhaustion, hips, HSS, PAO, Periacetabular Osteotomy, recovery, screws, stitches, surgery on January 4, 2014 by dramaticallyhip. Happy New Year! I hope everyone had a fantastic time celebrating the end of 2013/start of 2014. I spent last evening at home, recovering from yesterday’s removal of 7 of the 8 screws that were installed during my PAO and Open surgeries. 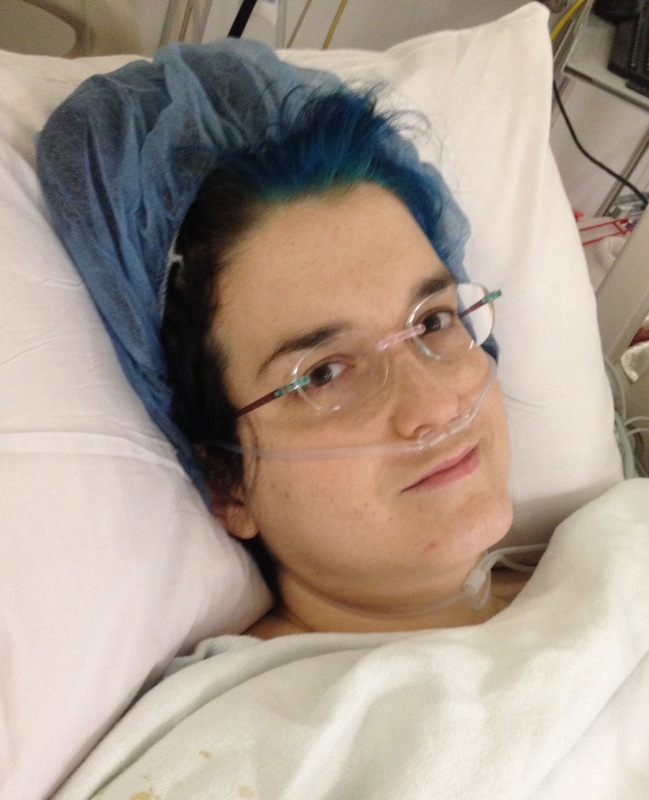 Here’s a (rather long) recap of how surgery went and how recovery has gone so far. Surgery was initially expected to take about an hour and a half; it ended up taking closer to two and a half hours. Anesthesia consisted of a spinal and sedation. Dr. S started by removing the 3 screws from the left side which had bursitis that he had to clean-up and then removed 4 of the 5 screws from my right side (1 of the screws was positioned too deep to be easily removed). I woke up in the PACU in a lot of pain in my left side, a burning ache from my left hip down my left side into my knee and cramping my left calf, pain at about a 7 or 8/10. The pain in my right side was not nearly as bad, about 3/10. The nurse injected liquid Motrin into my IV (which basically had no effect) and then injected Dilauded which worked right away (thank goodness). Dr. S stopped by to check on me (I only vaguely remember that he was there, I was still drugged from surgery) and talked to my husband about how the procedure went. The nurses in pre-op and the PACU were very warm and helpful (another great experience at HSS). I was in the PACU for 2-3 hours, had 1/2 a cheese sandwich and some ginger ale, and my first dose of Percocet. I got to the point where I felt ok enough (pain at about a 4/10) that I managed to dress myself and was released last evening. The evening was uneventful and I faithfully took my Percocet every 4 hours, even through the night which was restless and insomnia filled. Unfortunately, this morning I made the mistake I tend to make the day after surgery – I felt so OK, pain wise, that I thought I could wait 5-6 hours to take my pain meds. Bad, bad idea. The pain in my left side, which had been at a steady 3 or 4 out of 10, spiked to 8/10, and I was suddenly in tears. Just then a nurse from HSS called to check-in with me (perfect timing) and reminded me that I MUST take my pain pills every 4 hours on the dot. So I’m on it, the pain’s down to about a 5 or 6/10, and we’ll see how the next few hours go. 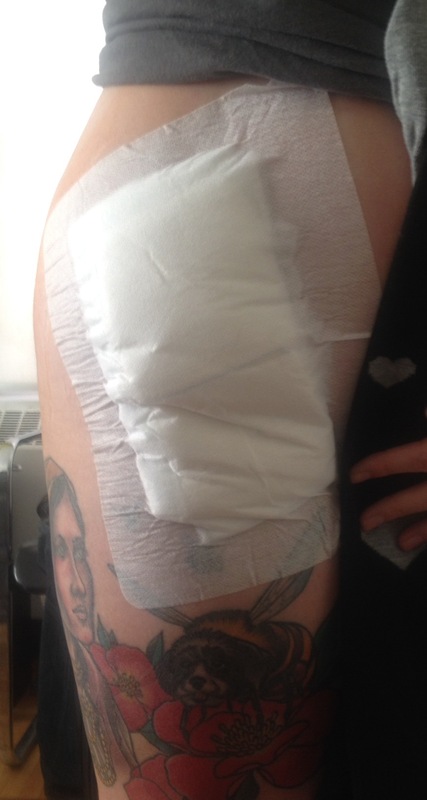 Here are some photos of the surgical coverings (and a peek at a few of my tattoos). 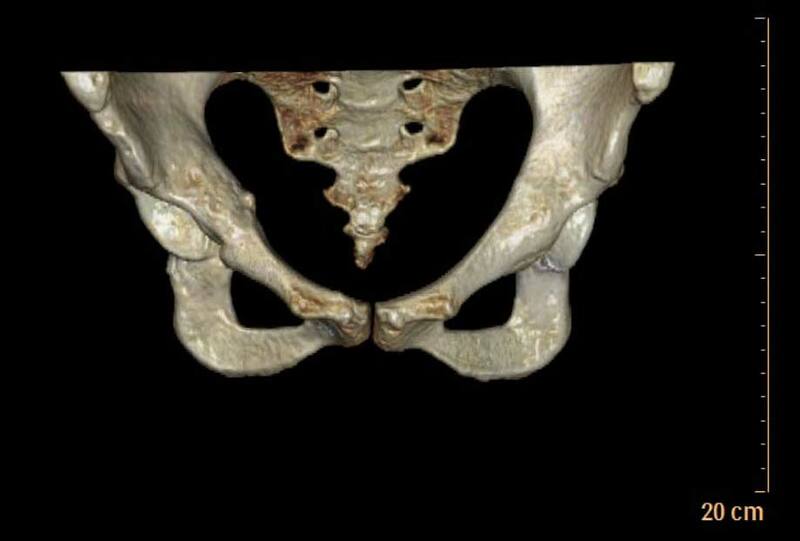 My left hip is on the left side, my right hip on the right. I can’t take off the gauze or take a shower until Friday so I won’t know how long the incisions are until then. Bathing in the sink until then — Yippee! My next appointment with Dr. S is Jan 13th when the stitches will be clipped and the steri-strips replaced. For now and the next few weeks I plan to take my pills and take it very easy. This entry was posted in Exercise, Hip Dysplasia, HSS, Knee pain, Leg Cramps, PAO, Recovery, Scar, Screw removal, SDD (Surgical Dislocation / Open), Stabbing pain and tagged Dr. Sink, hardware removal, hips, HSS, Insomnia, medication, medicine, PACU, pain, PAO, Periacetabular Osteotomy, surgical dislocation on January 1, 2014 by dramaticallyhip. It’s that time again – time for New Years Champaign and celebrations another hip surgery! Heck, I would barely know it was the holidays were it not for my annual surgery (in case you’re counting, this is year 3). The good news is that this one’s supposed to be WAY easier than the last two. As of 12:30pm tomorrow, New Years Eve, I am having all of the screws in my hips removed. The procedure, expected to take less than an hour, will be bilateral (on both hips) and will involve my fantastic surgeon removing 5 screws from my right hip and 3 from my left greater trochanter. Two big incisions to be sure (they will be reopening the incisions that were previously made and healed), but hopefully not TOO much pain. If all goes perfectly, I could be home in time to see the ball drop. Otherwise, I’ll see it from my bed at HSS. I honestly hate New Years Eve so spending the day in the hospital didn’t sound like such a bad option. The screws have been rubbing the soft tissue and causing a lot of pain and inflammation, especially on my left side where the pain shoots into my knee and all the way down to my ankle. On the right side, I can feel the heads of the screws through my skin — CREEPY! On a positive note, the screws are no longer needed. 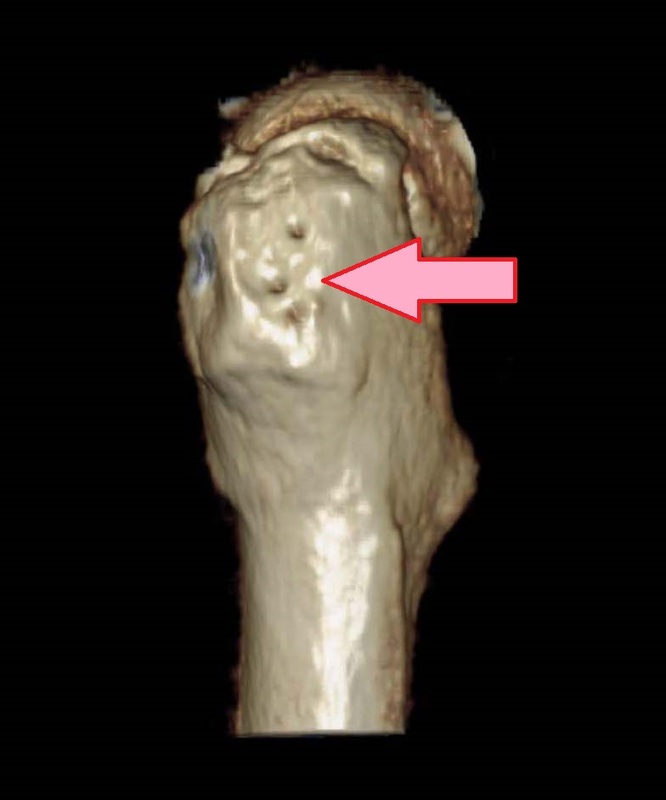 Since they were initially installed (in December 2012 and May 2013), new bone has grown in the spaces that the screws were holding in place and now they are superfluous. The idea is that once the screws are all removed and I get back to physical therapy, there should be no impediment to my getting better — like all the way, walk without pain or a limp, do things like a normal person, better. This entry was posted in Hip Dysplasia, HSS, Knee pain, PAO, Physical Therapy, Recovery, Recovery Pains, Scar, SDD (Surgical Dislocation / Open), Uncategorized and tagged hip dysplasia, HSS, Limp, medication, medicine, recovery, screws, surgery, surgical dislocation on December 30, 2013 by dramaticallyhip.